My rating: 9/10. Excellent watch. Affordable automatic diving watch. Today I’m doing a Seiko SKX007 review. Yes, it’s finally time, I’ve been putting it off for a while as it’s a pretty big review, but here we go. 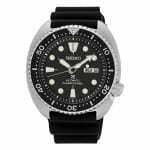 The Seiko SKX007 is one of the most popular well known Seiko Diver watches available. It’s a brilliant affordable diver’s watch with an ISO-rated case and a high quality build throughout. Many collectors start out with the Seiko SKX007, but it’s also well respected by many long time enthusiasts. You’ll see from this Seiko SKX007 automatic diver’s review why this timepiece has been so highly rated among the watch collecting community. 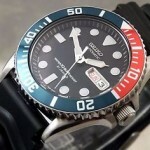 I hope you enjoy having a read of this detailed Seiko SKX007 review. To start I figured it would be a good idea to just take a look at the general specifications of the Seiko SKX007. This should give you a quick idea of the important details of the watch before we look at it all in more depth. The Seiko SKX007 isn’t one of the most popular Seiko watches for no good reason. It’s well built, has some great specifications, and is also affordable which is important to a lot of people. The casing of the watch is nice and large that gives the watch this bold appearance, something I like to see in diving watches. There’s also a uni-directional rotating bezel that has this lovely coin edged design to it, something I’ve always been quite fond of myself. The screw down is set at an offset position at the 4 o’clock mark on the dial. Overall the whole watch has a sturdy build to it, as you’d expect from a watch with a Diver’s 200m water resistance rating. This dial itself has a nice uncomplicated design to it. A key aim for diver’s watches when it comes to the dial is making them easy to read, even at a glance. The Seiko SKX007 manages to achieve this by keeping most the dial sparse and having these wide hands and hour markers. These hands and markers have a generous coating of LumiBrite making them easy to read in dim lit conditions as well. There’s also a useful day and date display at the 3 o’clock position. The day is shown in black on top of a white background for the weekdays, but on a Saturday it is displayed in blue and Sunday displayed in red. Overall I like this dial design and its high contrast finish with the white over matte. As is very popular with dive watches at the moment, the SKX007 has a nice large casing diameter measuring 43mm, 45.5mm if you take the crown into acocunt. With a decent thickness of 13mm the watch sits nicely on the wrist with a little bit of height to it. If you have smaller wrists and typically don’t like larger watches, then this might not be ideal for you, it’s just something that’s worth keeping in mind. This watch features Seiko’s proprietary Hardlex glass. This is similar to mineral glass that’s been specially hardened to be extra resistance to scratches and knocks. Seiko developed Hardlex glass for use in their Seiko, Pulsar, and Lorus watches. In this sort of price range Hardlex glass is something I’m quite happy to see. I don’t really expect to see Sapphire glass, especially on a Seiko, plus honestly I don’t feel there is any need for the added cost that would be involved in that. Earlier on I mentioned you can get this watch with a choice of different straps, this varies depending on the code at the end of th SKX007. For instance, a SKX007K like in the picture above would feature a durable high quality rubber strap with a 22mm band width. Whereas a SKX007K2 has a stainless steel Jubilee strap that’s flexible and comfortable to wear, as well as being easy to adjust. Personally, I prefer the rubber edition myself, I feel it fits in with the design a little bit better, but that’s just my personal opinion on it. You could always opt for fitting a Nato-style strap to watch. I’ve seen a few examples of this and have to admit it does look very nice, and switching the strap wouldn’t prove too difficult to be fair. The Seiko SKX007 features an impressive Diver’s 200m water resistance rating. This type of rating is ISO rated meaning it’s gone through all the rigorous testing to be classed as a proper diver’s watch. A Diver’s 200m water resistance rating is suitable for professional marine activity, serious surface water sports and scuba diving at depths not suitable for saturation diving. The thing with water resistance testing is that it’s done in a still environment with no added pressure. So 200m resistance doesn’t mean you can take it 200m deep. The very motion of moving your arm would increase the pressure forced upon a watch greatly from that that it would experience just submerged. 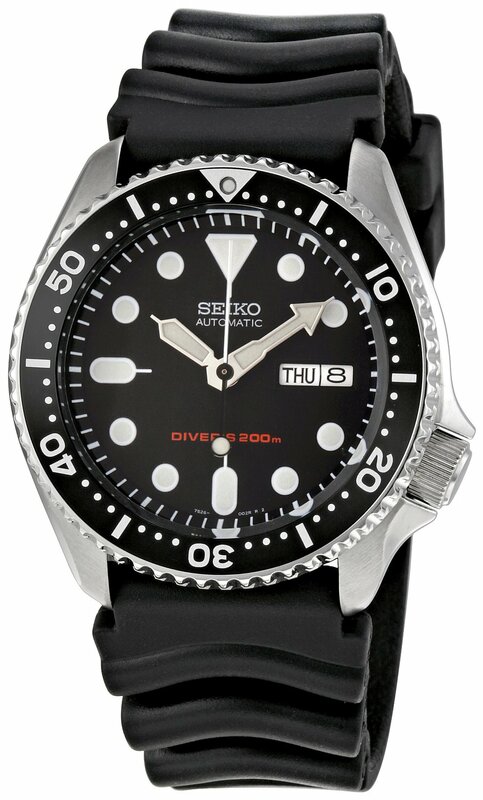 So there you have it, the Seiko SKX007 is specially tested and rated for scuba diving at depths not suitable for saturation diving. This should prove plenty for most of you and shows that this is built to a high standard, rather than some ‘dive’ watches that simple try and look the part. The Seiko SKX007 features Seiko’s popular word horse movement, the Seiko 7S26. This is an automatic movement with 21 jewels that’s made by Seiko. It’s an affordable movement that offers reliability and some fairly good accuracy. The movement doesn’t feature hacking, but it does have the quick date set function. Over a month you could expect to gain or lose about 1 or 2 minutes depending on variance with the movement. This isn’t too bad in my opinion, especially when you consider that with a date display watch like this you’re going to have to adjust the date most months anyway, so you could reset the time when you do this. At the end of the day I don’t expect automatic movements to be incredibly accurate on affordable watches like this. That being said I think the Seiko 7S26 offers some decent value for money and it’s a movement I’d be happy to have feature in my watch. I think now’s a good time to take a look at some of the pros & cons of the Seiko SKX007. I figured I’d display them in a nice easy to read format for any of you who are skim reading your way through. So there we have it, a detailed look at the Seiko SKX007. Hopefully, you can now get an understanding of why this watch has been so popular. 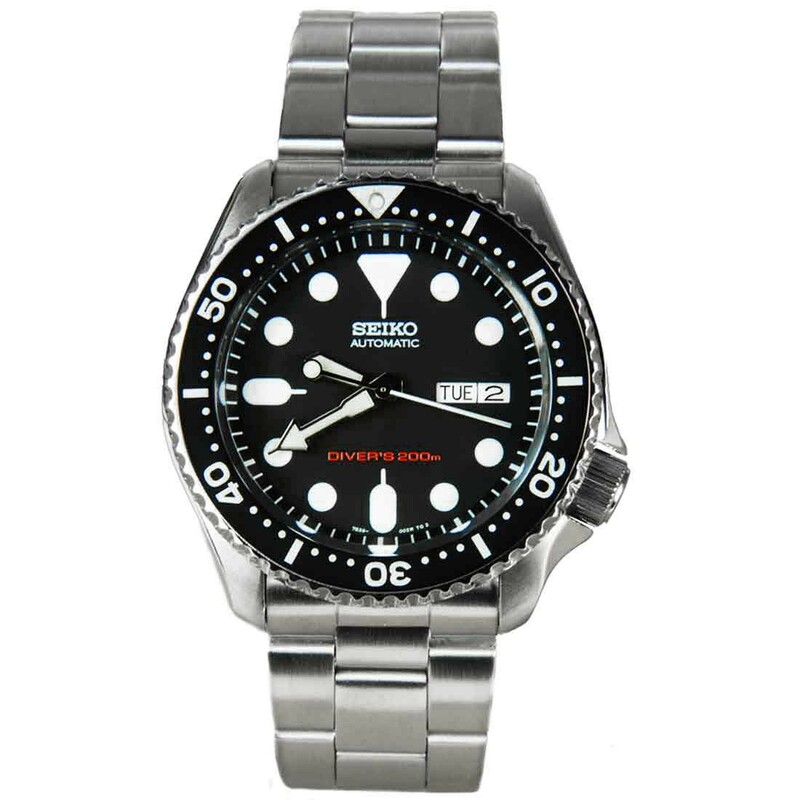 It’s a very in demand Seiko diver with a great water resistance rating and brilliant design. I know quite a lot of people aim to buy the Japanese made version of this watch. For this you’d be looking at the Seiko SKX007J or Seiko SKX007J1. Personally, this isn’t something I’m hugely fussed about but they’re there is you prefer them. Overall I really recommend the Seiko SKX007, it would be hard not to, to be honest. The watch offers some exceptional value for money so if you’re after a Seiko diver, definitely give this model some good consideration. Having looked at the benefits and highlighted a couple of very small negatives I feel this watch wholeheartedly deserves its 9/10 rating from us at The Watch Blog. I hope you enjoyed having a read through of this extensive Seiko SKX007 review. As always let us know in the comments section below what you thought or nay questions you might have. 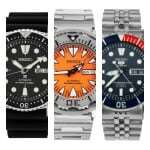 Why not check out our best divers watches for men next.